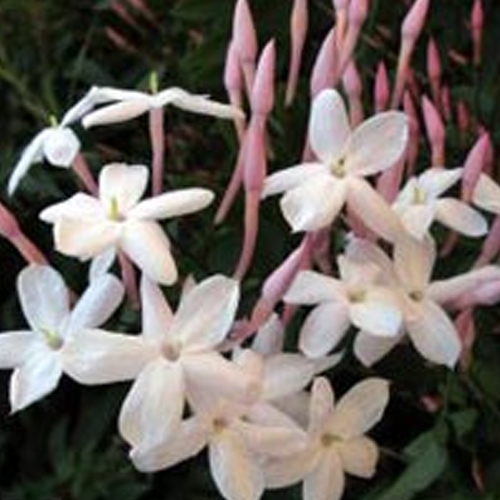 A perennial climbing plant that is native to Himalayas, Jasmine bears sweet, highly scented flowers. The oil is extracted using solvent method that helps in safeguarding the properties of the oil. Retaining in the oil freshness and soothing odor of Jasmine flowers, the extracted oil is available in form of reddish brown transparent liquid. The chemical composition of Jasmine includes Benzaldehyde, Benzoic acid, Alpha-terpineol, Benzyl acetate, Farnesol, Benzyl alcohol, Eugenol, Geraniol, Nerolidol, Jasmone, Linalyl acetate, Salicylic acid, Vanillin. The pure jasmine perfume oil is a volatile oil that is solvent extracted from Jasmine flowers. Besides host of therapeutic benefits and usage a solvent for perfumery purposes, the extracted oil is noted for providing emotional comfort during depression and also instilling feeling of spiritual rejuvenation. Its usage in cosmetics helps in safeguarding sensitive/mature and aging skin. The oil is also used as an aphrodisiac where its luscious fragrance is used to stimulate and intoxicate senses. Jasmine perfume oil of Jasminum Grandiflora family contains in it strong and rich scent that is delicate in nature. With main constituent as Benzyl benzoate (Ester), the properties of Jasmine Oil include as Antiseptic, Aphrodisiac, Stimulant and Antispasmodic. The extracted oil has extensive usage in perfumery industry and is noted for providing unique smell to products like soap, creams, alcoholic & non-alcoholic beverages, moisturizing lotions, toiletries and aromatherapy oils. Besides this, the oil also benefits as an Aphrodisiac and helps in solving issues related to Impotence, Frigidity and Meditation. Aroma therapists utilize Jasmine oil for its therapeutic properties as it has in it properties of antidepressant, anti-spasmodic, stimulant, antiseptic and aphrodisiac. The extracted oil is also used in washes and ointments. Further, the oil of Jasmine flowers also acts as a gentle remedy for inflammation, reducing physical irritation and sensitivity to pain in the affected body area. With add on usage to round out scents, the extracted Jasmine Perfume oil blends well with Geranium, Rose, Vanilla, Chamomile, Cinnamon, ylang-ylang, Sandalwood and most other essential oils. Solvent extracted Jasmine perfume oil has host of therapeutic and other beneficial uses besides its application in perfumery industry. Some of the typical preparations in which these are used in include Washes, Creams, Liniments, Infusions and Teas. The oil can be applied through different methods including by Diffuser, Massage, Inhaler, Lotion and Facial Wash.
Women trying to get pregnant should avoid this herb.